Reliable and cost efficient solution for monitoring and analyzing changes in river ecosystems. visualizing and evaluating measures to improve the ecosystem conditions and achieve compliance with environmental policies. Comparing data from periodical surveys enables a precise and in-depth analysis of the effects of earlier deployed measures. Our solution makes it significantly easier for owners and operators of hydro plants to gather data about the effects of the plant operations on river ecosystems and create cost-efficient solutions to achieve compliance with local and EU laws regarding environmental protection and biodiversity preservation. This service is most useful for owners and operators of hydro power plants who need reliable and cost efficient solutions to monitor and analyze changes in water ecosystems and achieve compliance with existing environmental policies. Contact us for pricing and in-depth information about this service. Our method of surveying river ecosystems- airborne hydrography with LiDAR systems – is cheaper and significantly more accurate than alternative approaches such as employing sonars or human divers. Surveying of the river is done from air – unlike when employing human divers or sonar systems, no adjustments to power plant operations are necessary. The 3d models of the coastal and riverbed conditions are a valuable aid to understanding ecosystem conditions and analysis of efficiency of existing and potential measures to preserve and improve fish habitats. Planned measures can be included in the model and evaluated directly. 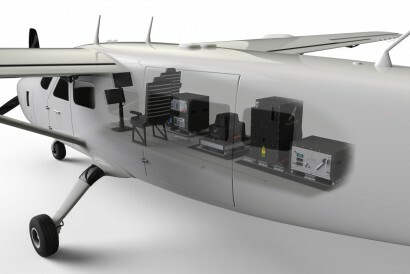 HawkEye™ – a combined airborne bathymetric and topographic multi sensor LiDAR system. Scienvisic uses an airborne LiDAR system to scan the river bed and the surrounding coastline and generate data in form of a point cloud. Thermography can be used to gather additional information about the temperature conditions in the river. The data is then processed and used to generate a 3d model of the scanned environment. The model provides information about composition of the river bed – e.g. mud, stones, sand – as well as environmental conditions and composition of the surrounding coastline. The model is a valuable tool to aid decision making and to predict and evaluate the efficiency of planned and deployed measures to preserve and improve fish habitats in the river. Contact us to find out more about how our solutions can help your business to analyze and monitor changes in natural environments and achieve compliance with local and international environmental standards. © 2015 Scienvisic AB. Design: Brazen.